Catsparella: Moderncat Studio Toy Giveaway Winner! Thank you again to everyone who entered the Moderncat Studio Toy Giveaway! I used Random.org to determine the winner, and it selected comment #5, belonging to Alex who said, "My kitties would love some new toys!! Especially because they've been way too interested in my phone charger [maybe they destroyed two already]." 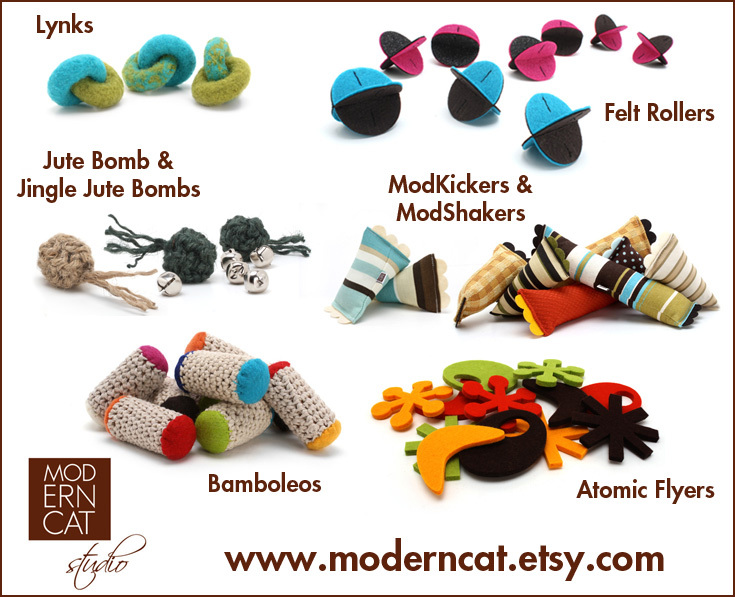 If you'd like to treat your kitties to some Moderncat Studio goodies of their own, please check out their shop for more information. Congrats again to Alex and her cats! I have a feeling her phone charger will be getting some much needed respite once the toys arrive! Concatulations to Alex and her cats! They are really going to enjoy their prizes for sure!